Sorting out Sid is Yashodhara Lal’s second book. The first one, “Just Married, Please excuse” is a hilarious take on the life of a newly married couple. In her own words the book is rather autobiographical. Sorting out Sid on the other hand, talks about the trials and tribulations of the protagonist Sid aka Siddharth Agarwal in the corporate world as well as in his personal life. Sid is your regular guy with regular problems. Ok, not so regular because his biggest grievance is that his desk is too close to the loo so he is wary of shaking anyone’s hand if they come to his desk straight from there ! Sid’s usual reaction to the complexities in his life is to go into the denial mode, half hoping his problems will go away on their own. He tends to wander into his own thoughts; half listening to what others are saying and this almost always lands him into foot in the mouth situations. To these idiosyncrasies, add a steadily crumbling marriage, possessive parents, an obnoxious boss fond of cracking Bathroom jokes, and an HR head showing a little more than professional interest in him and you have “Sorting Out Sid”. Sid also has a different garb for the different roles he plays in his life – The Obedient Son, The eager beaver of an employee, the socialite and the always-acting-goofy Friend. The real Sid gets a little lost in all this. The only place he can be himself is with Brownie – Someone (or is it something!) he can have intimate conversations with over endless bottles of beer because in his own words “You know why I love you so much, Brownie … You are such a good listener. You don’t judge. You don’t preach”. Despite the complexities in Sid’s life, the story is simple and uncomplicated and the characters well etched out. There is no hotchpotch of parallel stories or numerous characters. All the characters, big or small play their own significant role – even the obscure maid Sid’s soon to be ex-wife hires does her own bit to make the plot funny. What actually made this book such a delightful read for me was the way Yashodhara Lal has treated the story. Her strength as a story teller lies in the fact that she manages to convert even the most mundane everyday life incidents into humorous tales. The story line is actually serious. We are talking about breakdown in relationships and work politics – But Yashodhara tells these sordid details with such wit and humor that you will end up laughing out loud and commiserating with Sid at the same time. Another thing that stands out about the book is that it has been written from Sid’s point of view. This is perhaps the first time I have seen a woman writer write a book from the perspective of the male protagonist. And I must say she does it with great panache and aplomb. There is a whole lot of conversational tone and Hinglish used in the book – which works wonderfully with some readers but then not so well with some. The sort of reader that I am, I usually go for the language. Exposition and wordplay is usually the first thing I will look for in a book, and if the book doesn’t have that then the plot better be racy and full of intrigue. Sorting Out Sid offers you neither. There are no elaborate descriptions and the plot is actually rather mundane – Just a sequence of events that happen in Sid’s life. And frankly in between the plot tends to drag just a wee bit. But Yashodhara Lal wins you over with the quirky dialogues and the situations laced with droll humor. 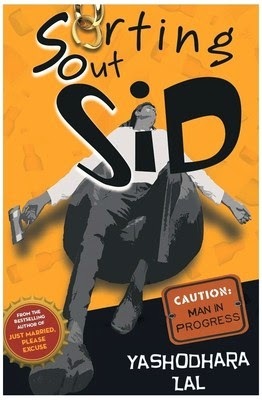 The book is peppered with absolutely hilarious monologues that Sid has with himself. The language is simple but flows very smoothly. There is no symphony of words here but then there are no jarring notes either. Yashodhara Lal knows the pulse of her readers well. This is the sort of book that young India will relate to. For aren’t we all a bit like Sid - bumbling through the stresses of modern life and in the process still trying to Sort ourselves out! Sorting Out Sid is a fun and breezy read. A book you can enjoy with a cup of coffee or a beer – while you sit comfortably ensconced in your bean bag. It will make a perfect antidote for a bad work day! I found Yashodhara Lal witty and much better than loads of writers these days ! Aha, so it seems that it is in the category of a train read. Read it for a couple of hours and have a smile on your face. Nothing that will stay with you for long. I haven't read her first book either. Maybe, on my next train journey, I may just pick this one up :). It will leave a smile on your face. A light and breezy read ! I have read it and I agree. It is a light read with a generous sprinkling of humor. Lovely review! Glad to read your take on it! Thanks Dipali. Glad you liked it ! hmmmmm .. right lets see if i can get my hands on it .. The Japanese and the Art of Packing Lunch !